The first fortification to be located on the site of the current Fort Ontario was built by the British in 1755. Called ‘The Fort of the Six Nations” or “Fort Ontario,” this was an eight-pointed wooden stockade, furnished with swivel cannons, effective only against small bodies of attacking troops. Built to accommodate 300 men, the first Fort Ontario was destroyed by the French under the Marquis de Montcalm in August 1756, along with all other British defenses at Oswego. Construction of a second British fort at this same location began in 1759. The second Fort Ontario was a large earth and timber fortification built according to the latest European military technology. Designed to accommodate 500 men, it contained low barracks with casemates, single story timber barracks, a dry moat, and extensive outer earthworks. Small square or triangular forts called “redoubts” were located on strategic high ground several hundred meters away from the main fortification. Built without rear walls, so that if captured by an enemy they could be fired into by cannon in the main fort, redoubts provided a formidable first line of defense for those defending Fort Ontario. During the American Revolution, after the Battles of Saratoga, Oriskany, and the siege of Fort Stanwix in 1777, the British were temporarily demoralized and abandoned Fort Ontario leaving it vulnerable to attack. Consequently, in 1778 the second Fort Ontario was destroyed by American troops based at Fort Stanwix, located in present-day Rome, New York. Seeking a strong base from which to raid the rebel-held New York State, the British reoccupied Oswego in 1782 and rebuilt Fort Ontario for the third time. In 1796, the fort was turned over to the United States. The Americans did little work on the fort before and during the War of 1812. Undermanned and possessing only six condemned cannons, Fort Ontario was attacked and destroyed by overwhelming British land and naval forces in May 1814. 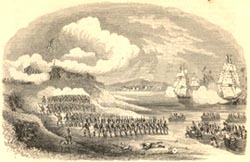 The threat of another war with Great Britain and a possible invasion from British-held Canada caused the United States to regarrison the ruined post in 1838. 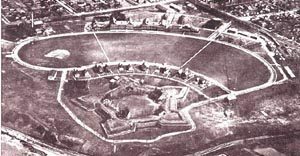 Between 1839 and 1844, the present-day Fort Ontario was built of earth and timber with a sloping outer face. Designed to accommodate 120 men, it included a Powder Magazine, Enlisted Men’s Barracks, Officers’ Quarters 1 and 2, and a Storehouse. Civil War and post-Civil War improvements involved the construction of the East and West Guardhouses, reshaping of the outer earthworks, and replacement of the sloped timber and earth outer walls with vertical stone masonry. The failure of Congress to provide funds for major improvements after 1872 began the fort’s long period of decline. In 1901, Fort Ontario was abandoned. Fort Ontario found new life between 1903 and 1905 when the United States expanded the post to battalion size as part of the reorganization of the army under Secretary of War Elihu Root. Over two dozen brick and wood frame buildings were constructed outside the old fort to house the larger number of troops and support services. The old fort, however, was abandoned until 1928, when the Enlisted Men’s Barracks was turned into an officers’ dub, and the other large buildings converted to apartments for junior officers. The post continued to grow; by “1941 approximately 125 buildings stood at Fort Ontario. Between 1944 and 1946, Fort Ontario was used as an emergency refugee center, the only one of its kind in the country, for victims of the Nazi Holocaust. 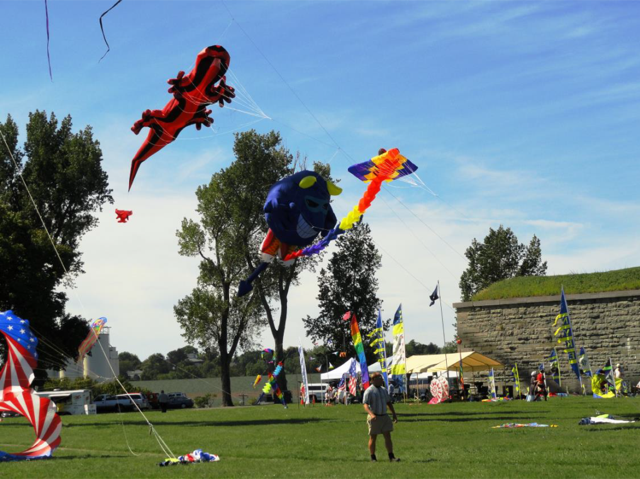 In 1946, the fort was transferred to the State of New York Initially used to house veterans and their families during the post-war period, development of the fort as a State Historic Site began in 1949.